The weather conditions of the Pacific Islands can be absolutely sensational at times and yet relatively harsh during other seasons. Shade7 are proud to supply their beautiful outdoor cantilever umbrella that not only adds to the appeal of tropical resorts, but provides a strong and functional solution for shade coverage amidst this tropical environment. “Small patch of heaven”, “the best island in the world”, and “blue waters that change from a sapphire blue to a turquoise and back again” are some of the words that have been used to describe the imprinting islands of Bora Bora. One of the resorts that has contributed to the history and progression of the French Polynesian Islands is the Four Seasons Resort. With 107 rooms, 100 Bungalows, 7 Villas, and 15 residential units, the Four Seasons resort claims the title “the best island in the world” given by U.S. News. The luxury setting is made up of two beach-fronts, one of which receives the winds and water/salt spray, the other is facing inwards and traces the flat transparent waters with limited exposure to unfriendly weather conditions. Previously the resort has relied on a number of wooden umbrellas that attempted to withstand the conditions of Bora Bora, unfortunately, wood expands and shrinks to the degree of exposure to moisture and heat, and within the Pacific both are plentiful. The ill-suited wooden umbrellas would expand, crack, and inevitably disintegrate over time generating more cost in repair then the initial purchase. Four Seasons resort understood this and therefore sought after Shade7’s anodised aluminium umbrellas built to withstand such heat, moisture and winds. Shade7 were recruited to supply their Riviera cantilever umbrella, to facilitate in replacing the wooden umbrellas. The wooden umbrella that had previously been in place had needed a large intrusive base that customers of the resort disliked and walk into on occasion. The cantilever umbrella style of the Riviera sees the mast of the umbrella is situated to the side of the canopy providing optimal sun shade. The umbrella is also installed into a well-suited and “over-engineered” base plate that is 12mm thick and 315mm wide, providing an easy-on-the-eye finish. 8 of the 3.5m octagonal cantilever umbrellas cover a total of 69.6m² of sun shade with ecru canopies to match the white sands, which can be tilted shifting the canopy into a vertical position. The canopies are a marine grade acrylic canvas manufactured and designed to protect against the maximum amount of harmful UV light (80 UPF). The materials of the framing consist of stainless steel bolts and reinforced joints to eliminate the risk of rust and issues at the joints. The anodised aluminium framing, previously mentioned, ensures that the frame will not oxidise over the years of continuous use. The combination of flexibility; through the tilting and rotating functionality, the non-invasive mast and base fitting, and the durability of the umbrella in marine conditions provides that the Rivera cantilever umbrella is nothing short of the perfect sun shade commercial umbrella for the uniquely beautiful Pacific. 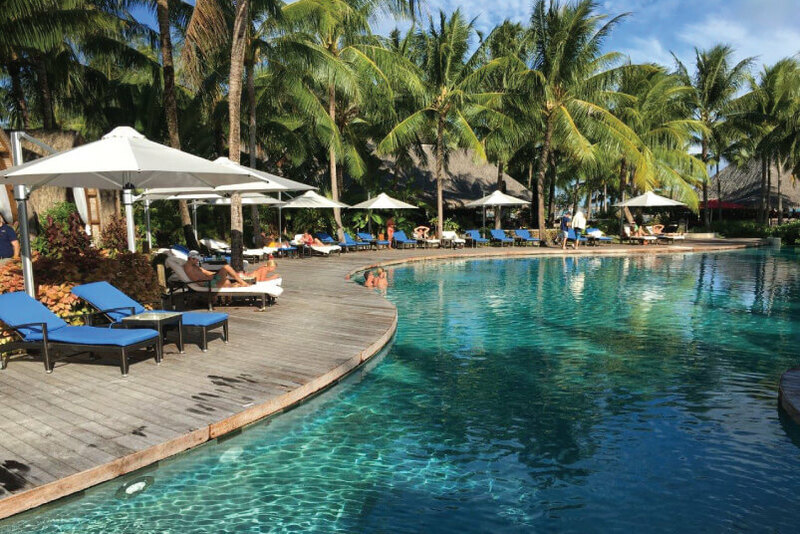 Whilst it is important for a tropical resorts to look amazing to appeal to their guests, it’s equally important to ensure that their facilities such as outdoor umbrellas will stand the test of tough tropical weather conditions. Shade7 continue to work with a wide range of resorts in Pacific who are situated on coastal settings. A recent project was Fiji Marriott Resort Momi Bay who opened their resort to customers in April 2017 after being newly fitted with centre post and cantilever umbrellas, featured in a sleek black mast. Commercial customers are encouraged to contact Shade7 to discuss how their umbrellas or outdoor furniture could be the perfect fir for their commercial setting.